Salmon & Eggplant Curry: We’re such curry fans that we buy the giant bags of jasmine rice. This recipe pairs salmon with eggplant, another great source of soluble fiber, and sugar snap peas (mmm...). Basil and lime infuse the coconut milk with just the right flavor. Salmon with Pepita-Lime Butter: This super-simple (fast!) recipe, seasoned with chili powder and lime, has great Mexican flair. I like to pair it with Maple-Roasted Sweet Potatoes and sautéed spinach for a dinner that weighs in under 500 calories and provides loads of powerhouse nutrients (beta carotene, fiber, folate). Salmon & Roasted Vegetable Salad: Roasted veggies and salmon (canned works great!) on leafy greens with a flavor-packed vinaigrette makes for a hearty dinner that’s packed with good nutrition. 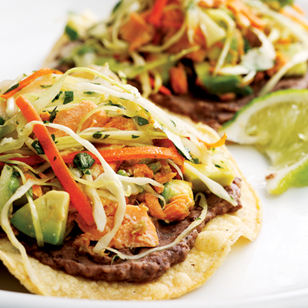 Black Bean & Salmon Tostadas: Avocados (which provide heart-healthy monounsaturated fats) and black beans (full of cholesterol-controlling soluble fiber) are big in my house—and canned salmon makes this recipe easy enough for weeknights.